Based on the audio piece created by Charna—Suburban Night—I decided to focus on the concept of suburbia but not in the way that we see it. As humans, we go about our busy lifestyle taking little notice to the destruction we are causing to the landscape—both in chaos (cars) and physical destruction (rubbish). I chose to use a dog as the perspective that we see the world in within my moving still image portrait. Using this perspective, we are able to see how, we as humans, are impacting the world in which he lives in. He can not take a stroll down the road and listen to the birds in the background without getting distracted by cars or curious to see what is on the other side of the fence, or scared of crossing the road—these are all man-mad structures. All a dog needs is water. food. love–his water bowl, food and can scraps and love replaced by destruction. I drew inspiration for these images from Photographer Wendy Devent who strapped camera’s to her dog’s neck to allow the audience to see the dog’s perspective of the world. For the rhythm of the piece I decided to use quick changing photos with very sharp cuts to demonstrate confusion and the fast pace world in which we live in. This concept was derived from the American Horror Story opening credits. However, I chose to use moments of visual silence as the scenes flash to black to convey movement to another part of the dogs journey. In these moments, I used dog sound effects like panting, running, barking and the jingling of his collar–an idea stemming from the movie Fight Club. Upon setting up my artwork, I had problems with the scale of the paper compared to the allocated space. After discussing many different places to present the paper, we decided that it would be best to leave it on the floor. This meant that I had to trim the edges to allow for people to walk around the room without ruining the artwork. Overall, I was really pleased to see the finished product( Both the painted butches paper and the video running) as the repetition and variation was really brought to life. Movement leaves no traces behind, no evidence as to where a person has been and gone. A dance is too forgotten by the space it once occupied once the music has ended, with the only evident recollection of the movement alive within the mind of the dancer. Accentuating the lost relationship between movement and traces in space, the monochrome dance recording paired with the coloured paint is used to create visual evidence of the movement. This so tracks the overwhelming feeling of a dance within the dancer’s point of view. Drawing upon Jackson Pollock’s Abstract Expressionism collection, which broke away from traditional means of art making practice, he used the repetition of painted lines, to create a variation in the final artwork. This notion is mimicked through the repetition of the dance to create a variation within the painted trace upon the paper. Therefore, expressing that no two movements are the same, where this realisation is only discovered through the visualisation of movement through paint. In order to ensure that I could actually perform what I had in mind, I needed to consult with Glen whom provided me with the butches paper, tarp, the camera, tripod and paint tubs. He also organised for me to perform in the downstairs carpark which he had sectioned off for me so that I had sufficient room. I set everything up and intended to have the pant tubs lines up before each new row of butches paper with a paint tube at each of the four starting points for the dance. I’ve decided to source music that does not have a sound, yet, at the same time is very dynamic. After a few hours of searching I found the song Sand. The song starts our slow then intensifies. I want to subtlety express this in the paint. 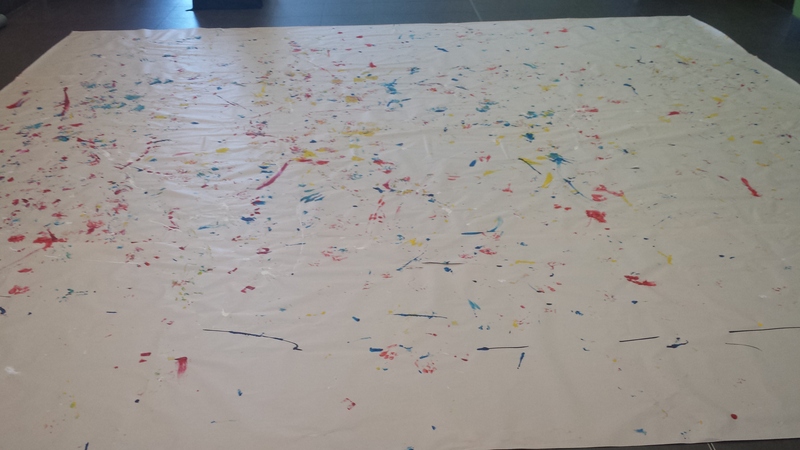 My inspiration for this piece stems from an artwork I was shown in the lecture by Jackson Pollock with the art period of Abstract Expressionism. This artwork stood our for me within the lectures as it is unconventional yet displays the ideals of repetition of the strokes to create a variation as a whole. This art form as a whole emerged in the early 1940’s where artists escaped from the norms of art making practice and style to produce avante garde artworks which convey the inner psyche, vulnerability irrationality and anxiety amidst World War II. Pollock abandoned the use of paint brushes and used raw paint to dab and splatter across the canvas–this challenged the classification of art as this practice was never seen before. I wanted produce something similar mimicking the scale, size and intent whilst using the technique of dancing which futher stems away from the conventions of artmaking practice. After further research, I came across this artwork which seems to be in sections from left to right (in three columns). I wanted to do something similar so instead of the individual pieces of butches paper, I spoke with Glen from tech support who was able to provide me with large pieces of butches paper in a roll. With this in mind, I created a dance which is somewhat within the confines of a small dance space so that there is a subtle indication as to the sections on the paper between dances. However, I also wanted the dance to overlap so I choreographed the dance so the my arms would flick paint further and my feet would smudge paint int a new section–thus mimicking a flowing dance which has no start or finish. As the final assignment for Meda102 is fast approaching, I discussed with my group the ideas that I had. Initially, I wanted to do an iteration incorporating dance, so had 2 options. I would perform a dance repetitively using paint on butches paper. I would dance with pieces of paper that but the end of the dance end up crushed. Both of these iterations would have a recording of me dancing to go with it. I discussed this with my group and we decided that the first option would be the most effective. They also suggested that while recording the dance that will go with the painted butches paper, I should wear the same clothes which will be covered in paint to merge the gap between the paint and no paint. We also decided that the music should be played also as the music is a big element which influences movement. Therefore, the repetition will be in the process of the dancing on the butches paper where the variation will be produced on the paper by the paint as the paint will be smudged and used in different ways throughout the repetition of the dance. Sonica is a dynamic generative artwork that replicates the notion and ideas raised by Alvin Lucier’s, ‘I Am Sitting in a Room.’ This 1969 voice performance consisted of the repetition and iteration of the single sentence slowly becoming muddled until the tones of the voice became a series of frequencies. Lucier’s decision to isolate the voice inevitably stripped back ego and identity and so reduced the artwork to simple forms of sound and echo within this sonic environment. This artwork became my inspiration as I too intended to represent just the echo and sounds of voice. I achieved this by appropriating the work of Michael Pinn (http://www.openprocessing.org/sketch/208059) to understand the workings of a ripple. From here, I altered the code allowing me to fully understand different functions that I hadn’t previously practiced. I was comfortable within the confines of iteration of a loop within a grid. I wanted to escape this confine and work with an iteration in individual shapes. This has been an interesting learning experience as I realized that keeping it simple created an aesthetic appeal—much like Lucier’s work—whilst too experimenting with code and shape to replicate and iterate a form that is invisible to the naked eye—sound and echo.